Regular use of Ionyte Trace Minerals can re-connect your energy field ! 100ml Bottle is enough for 3-4 doses per day for 30 days. It is as easy as squirting a half dropper full under the tongue & allow it to be absorbed straight into your system via sublingual method. It can also be taken with water. 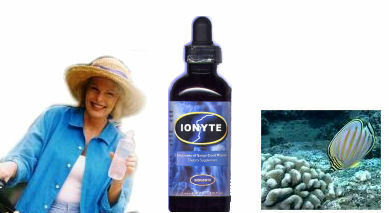 Both the Ionyte & AquaLyte are extremely powerful alkalisers if used together. Email for discussion papers done by a US Doctor (who shall be nameless by request) on Organo Mineral Complexes (Ionyte) . At the time, he worked as a medical director of a multi-specialty clinic with ongoing clinical research projects in cellular regeneration. He is the former chair of the department of Osteopathic Medicine at a highly recognized medical school. This Doctor has taught at other medical schools throughout the United States. He has also authored a book on the immune system, as well as articles published in a major medical journal.